[Larry] and [Carol] just upgraded the coop to make their lives easier, and to help keep the chickens happy. 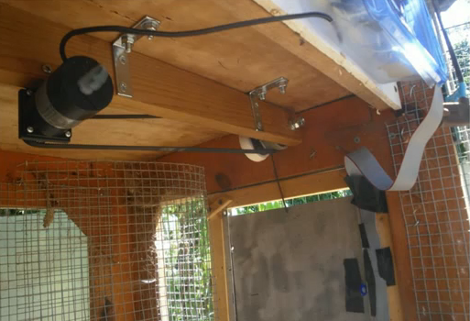 The image above is a chicken’s-eye-view of the newly installed automatic door. It’s a guillotine design that uses the weight of the aluminum plate door to make sure predators can’t get in at night. This is much easier to fabricate than a locking coop door would have been. Some leftover aluminum channel guides the door on either side, with a spool above it to wind up some rope, thereby lifting the door. You can see the belt-drive motor is also mounted inside, out of the element. To the right of the image you can just make out a plastic food container. This protects the electronics from the elements. Inside you’ll find an H-bridge to drive the motor, a real-time-clock to make sure the schedule is well-timed, and an Arduino. There are a couple of reed switches which let the microcontroller sense the position of the door. After the break you can see a demonstration video, as well as a slide show with build details. The motor is pretty quiet and, although it spooks the chicken in the demo just a bit, we’d be they’ll be used to it in no time. Because if it had four, it would be a chicken sedan! it should probably have a light or a chime before it starts moving, so the chickens can learn to go inside before the door closes and leaves them stuck outside in the scary-stressful world. As long as you set the timer for a little after sundown, you shouldn’t have a problem locking out any chickens. When it starts getting dark, I head out to the coop and they’re always inside roosting. That’s very helpful. I’m in the process of doing something similar. However, I already have a swinging (side to side) door on the coop, so I’m using a linear actuator salvaged from an old satellite dish. Actually, the chicken wasn’t bothered at all by the sound of the motor: she’s the basket-case chicken, afraid of her own shadow and petrified of letting a human get within 8′ of her. Don’t worry about some chickens that arrive to late. Natural selection will kick in… Soon there won’t be any chickens arriving late. Motor is probably best mounted outside the henhouse, where it’s easier to get to, to clean off the dust, I speak from first-hand experience here, having burned out one motor doing the exact same thing. Also, I manually close the henhouse door at night. Not because my design requires it, but my hens enjoy being counted, and I get the peace of mind knowing my girls are all safe and sound inside with no cats or dogs (it’s happened) in there with them. Who woulda thought, there are a lot of technically inclined chicken owners…. Thanks for that link. It just so happens I have a launchpad sitting right next to me waiting for something to do. I built one years ago using a reversing flue motor, timer, relay and a photocell (still have it somewhere, just not the chickens). Door opened when the sun came up and closed when it went down. The timer was for a delay at dusk, when the chickens came in for the day. No need to change the timer for the different day lengths. Hello Richard, I read your post and was wondering if you could show me how you built your setup. I have zero electronics experiance but I can follow instructions. Your setup is exactly what I am looking for. I looked at chrisatronics but not sure I can get all required parts. forgot to check Notify me of follow-up comments via email. I’d use some paint to make the bottom edge resemble a guillotine. Next a way to round up the birds at sunset, and to close the door/ramp. I would have a fast mode so that it actually worked as a guillotine…then hook up a remote control switch and when predators come around, open it just long enough to let them get their heads in…then close it and you have fox for dinner. We made an automated chicken coop door because twice we came home after partying and there was a possum in the coop. And because if we don’t let the hens out at dawn, they make a heckuva racket and bother us and the neighbors. The timing is set so that it closes well after the chickens are inside, since they always go in naturally at dusk. So we set it at dusk plus 30 minutes, and adjusted it a little later after observing them. We also adjusted the timing earlier in the morning because they get up with first glimmer of light, well before dawn. So it doesn’t need a chime to warn them when it closes, they will always be inside. And believe me, they are often standing at the door when it opens in the morning. I wouldn’t put the motor outside in the rain and sleet and snow for anything. But we could staple another plastic box over the motor with a cutout for the drive belt, to keep the dust down. The motor area is not inside a barn-like coop, but rather the coop simply has hardware cloth for walls, so we don’t see much dust buildup as the breezes blow through. In the video, the hen is not spooked by the door, she is just deathly afraid of people and wanted to get away from Larry, but he was between the hen and the gate. She’s a freaky chicken all the time. The hens are completely used to the door after only 1-2 days, no problem. I’m sure by now they are all Pavlov on the sound of the motor and rush to the door in the morning when they hear it, just like they rush to the gate when the hear the back porch door open. We didn’t use a photo cell because our experience with both the X-10 photo cell and another hacked one is that they get fooled by lightning (opening) and by dark midday storms (closing) so we don’t trust them. With the settable timer, we can also opt to let them out into the run under artificial light, which comes on before dawn in the fall/winter, so that the hens get their requisite 14 hours of light so they continue laying eggs rather than the normal molting and stopping laying as the daylight shortens. So far so good, it’s been working well, but we will keep an eye on it in the winter, will likely have to clear and lube the tracks when it snows. Nice job, I needed one this spring but didn’t have tome to build my own. Buy this one if you are short on time. Use with a digital appliance timer and you are set.